Nick Higgins, the author of this paper, is employed by CRA Inc as an instructor on the USMC Level II Anti-Terrorism Officers Course. He spent six years in the British Army as a member of 2nd Battalion, The Parachute Regiment including a 2 year tour in Northern Ireland involved in intelligence gathering duties. >From 2003 to 2007 he lived and worked as a security contractor in Afghanistan including nearly a year in Helmand and Kandahar Provinces. 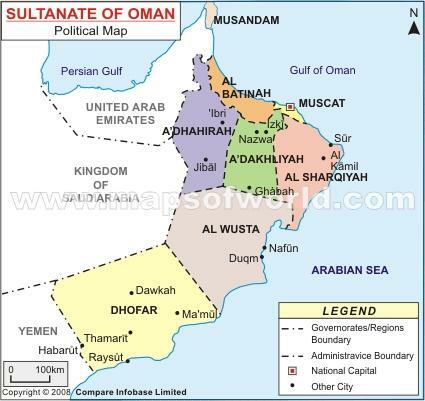 1: Political map of the Oman showing Province boundaries. From 1971 to 1975 a small but none the less hard fought counter-insurgency campaign was waged in Dhofar, the most southern province of Oman. In fact the flag of rebellion had been raised much earlier, in 1962, and by 1970 the communist backed tribal guerillas controlled the whole of the Jebel Dhofar. The half-hearted and inept operations by the (mostly northern Omani) Sultans Army had done little to stem the insurgency but everything to drive recruits into the rebels’ hands as they failed to come to grips with the guerilla groups but lashed out at the local civilian population. However, in 1970 things began to change as the old Sultan, Said Bin Taimur, was deposed with British help by his son Sultan Qaboos Bin Taimur. The old Sultan had kept the country firmly in the middle ages by his feudal system of Government and his refusal to allow any kind of modernization. Speaking to Omanis about this on a recent visit to the Oman the author was told that the country was like one big prison in which the people were allowed to do nothing.